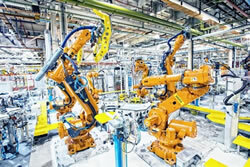 The Engineering and Physical Sciences Research Council (EPSRC) has announced the launch of a new robotics network that aims to foster academic and industry collaboration. The UK Robotics and Autonomous Systems Network (UK-RAS Network) will have a strong academic foundation, with a number of universities acting as founding members. According to the EPSRC, the network has already received strong support from major industrial partners, as well as from professional bodies such as Royal Academy of Engineering, IET, and The Institute of Mechanical Engineers.